Get ready for a flavoursome encounter as you head to the Isle of Spice, where the choice of Grenada hotels will enhance your enjoyment of a spectacular Caribbean paradise. Sophisticated and elegant, the Grenadian is a majestic Palladian hotel, overlooking two broad soft sand beaches offering a wealth of water sports and relaxation. Located on the island’s best beach, Pink Gin, Sandals LaSource Grenada Resort & Spa defies every convention of traditional design with 3 unique villages. Home to 10 restaurants, 6 bars, 5 pools and so much more, this resort is perfect for couples looking for a world-class destination with a world-class resort to match. Plus, no other resort in the entire Caribbean has suites as unique and decadent as the ones found here! Nestled on a lush green hillside taking in spectacular views of the Caribbean Sea and overlooking the picturesque Grand Anse Beach and Bay is the family-friendly Flamboyant Hotel. 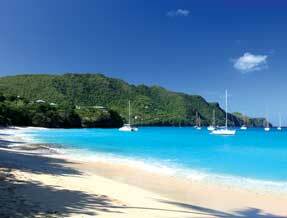 Back in September 2004, Hurricane Ivan wreaked carnage on the island, but with true fighting spirit, Grenada has recovered to position itself as one of the region's most sought after holiday destinations. The capital St George's was devastated by Ivan, but has rebuilt and now once again boasts a picturesque waterfront that sets off a town that is both lively and welcoming - an excellent place to stay if the slow pace of the beach isn't for you. However, if hitting the sands is your main priority, the renowned Grande Anse Beach will likely serve as your best bet. One of the island's most stunning stretches of sand, it houses a number of five-star resorts, as well as more reasonably priced hotels. Hit the beach and soak up the rays, get your kicks with some water sports and diving, or learn more about the spices the island springs forth, such as nutmeg, cinnamon, vanilla and lemongrass to name but a few - Grenada's year-round heat equates to an ideal holiday getaway.